Last year I wrote about Jean Cocteau’s beautiful re-telling of the story of Beauty and the Beast, La Belle et la Bête (1946). In many ways it was a perfect movie for the age, giving war-weary French audiences an hour or two’s respite in fantasy while re-asserting French tradition and culture through the art of Claude Lorraine and the tales of Charles Perrault. Four years later Cocteau was ready to return to edgier surrealism. 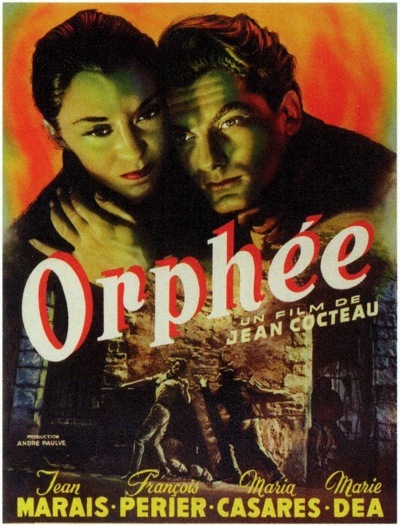 In 1950 he released Orphée, a stunning retelling of the legend of Orpheus set in contemporary France. It’s the second of a trilogy, the first and last films being Le Sang d’un Poète (1930) and Le testament d’Orphée (1960), both so utterly bonkers that the middle one looks like an essay in gritty realism. 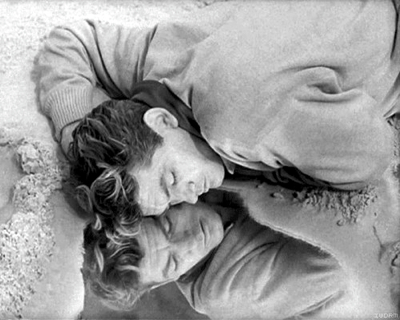 In Orphée the famous poet Orpheus (played by Cocteau’s partner Jean Marais) sees another young poet, Cegeste, killed in a traffic accident by two leather-clad motorcyclists. A mysterious woman (the Princess) asks him to accompany her as a witness to the incident in her black limo and they drive away with the body of Cegeste. The woman turns out to be Death, who is currently spending her afternoons off running over poets and taking them to the underworld through mirrors, which are gateways between this world and the next. Orpheus wakes later in the middle of nowhere with no recollection of what’s happened, but unbeknown to him Death has fallen in love with him. In a scene that takes stalking to transcendental heights she appears every night at the foot of his bed and watches him sleep. 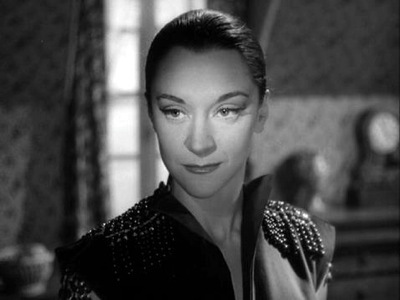 This, apparently, is the epitome of romance to French surrealists and indeed María Casares is drop-dead gorgeous in the role. At the same time Death’s ghostly chauffeur falls for Orpehus’s wife, and to cut a long story short, she also dies and Orpheus has to go into Hades to get her back. The rest of the story more or less follows the original myth, though Cocteau takes many of the familiar tropes and gives them an interesting twist. When Eurydice returns to Earth Orpheus can’t look at her, not even through mirrors, and Cocteau cleverly plays around with the domestic issues this causes. The Bacchantes, who traditionally tore Orpheus apart before tossing his head into the river (where it continued to sing), are now a group of feminists led by the famous chanteuse Juliette Gréco (who’s the spitting image of Kate Bush in this movie – another perfect reason to watch it). It sounds dreadfully pretentious, a typical art film for serious minded Kinema students to watch late at night and then Discuss Over Wine and Gitanes, and yet Cocteau’s inventive wit and use of stunning imagery turns it into an incredibly cool movie. He’s also quite happy to poke fun at the avant garde. At the very beginning Orpheus is given a magazine of poetry called Nudisme, which contains nothing but blank pages. Orphée is full of memorable scenes. Simple tricks, such as reverse slow motion and negative film, are used to great effect. Mirrors are the doorways to the realms of the dead. The film makers used a sheet of mercury in one shot to show one of these mirrors rippling when touched by a finger. Because mercury is poisonous the actor had to wear gloves. 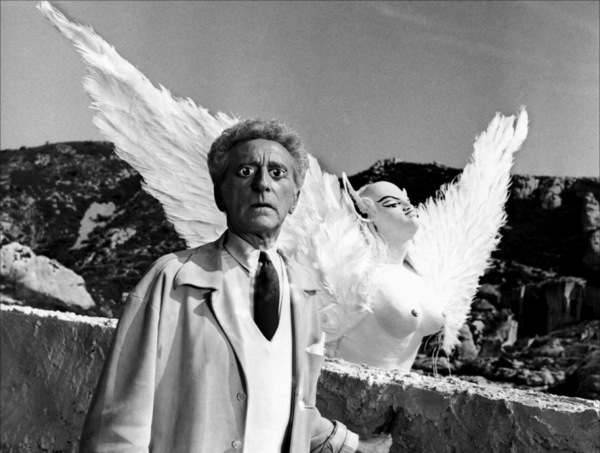 Cocteau turned this around by having Orpheus put on gloves to symbolise his intention to journey into Hades. Death’s motorcyclists in the underworld. 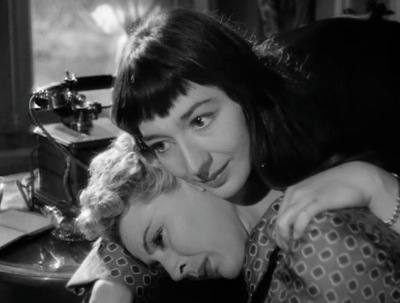 Whereas La Belle et la Bête was pure fantasy, a more serious purpose lurks beneath Cocteau’s portrayal of the giddy cafe culture of the 1950s new bohemians. Orphée is punctuated by images of the Occupation. Death’s black limo, with it’s motorcycle outriders, looks like a German staff car. 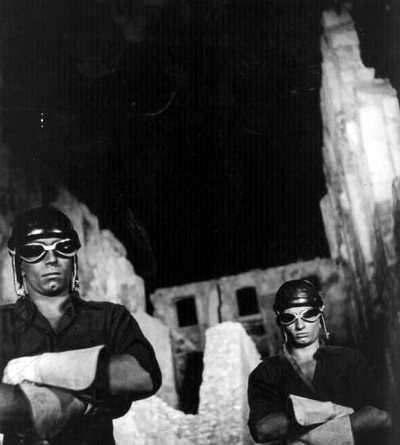 Its radio plays surrealist poetry that sounds reminiscent of the coded messages from the French Resistance. In contrast to the bright sunny world of post-war village France, the underworld is an urban jumble of ruined war-torn buildings and the judges of the dead look for all the world like party officials engaged in an interrogation. Yet despite this Cocteau’s version of the legend imitates the operas of Claudio Monteverdi and Christoph Willibald Gluck (he uses the latters’ music in the film) by having a happy ending. Ten years later Cocteau returned to the myth in Testament D’Orphée, this time casting Jean Marais in a cameo part as the blinded Oedipus and having himself face the tribunal of the underworld who demand to know why he made the previous film. The movie comes full circle in the trilogy. Like Le Sang d’un Poète it is completely plotless and has Cocteau wandering through a sequence of bizarre encounters. To give an example, he takes a hibiscus flower to the goddess Minerva (whose butler is Yul Bryner). She kills him with a spear and his mates, including Picasso, gather around his corpse. He then promptly comes back to life and wanders off, passing Oedipus and the Sphinx along the way, as you do. It’s worth watching for completeness though I can’t get past the nagging feeling that Cocteau is just taking the mickey with this one. You nail quite a few of the problems I have with French Surrealism and the nouveau roman in general. There are some gems (Les Enfants du Paradis) but much of it is pretty obscure. Where popular French comedy is an appalling mixture of mysoginist innuendo and toilet humour, much of what passes for ‘serious’ in the film world comes over as completely wacky. This could explain in part why so many French people don’t understand why Monty Python is funny. For them it’s sort of ‘normal’.